1st Cavalry General Alexeyev Regiment (1st officer's cavalry regiment). Formed in the Volunteer Army on March 25, 1918 as the 1st Equestrian (Horse, Horse-Partisan) Regiment (3 Squadrons). It consisted at that time almost exclusively of officers. From May - June 1918 was part of the 1st Infantry Division of the Volunteer Army, which took part in the 2nd Kuban campaign. 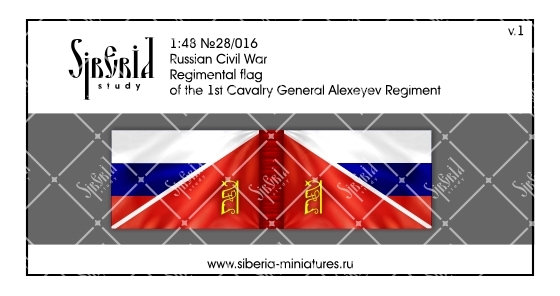 On February 14, 1919 was given the name "1st Cavalry General Alexeyev Regiment". Since May 27, 1919 was part of the 1st Brigade of the 1st Cavalry Division. On October 5, 1919 totaled 196 cavalry with 16 machine guns. From 19 November 1919 he was a member of the 1st Cavalry Division. The servicemen of the regiment wore a white cap with a red band and red with white piping around the shoulder straps.